Many routine hand conditions are treated in our practice. The following links provide a brief description of some of them. There are numerous other conditions that relate to the injury, disease and deformity of the wrist and hand. We are pleased to share with you our experience in the field of Hand Surgery and to provide state-of-the-art care in this area. There are a variety of conditions that fit into the categories of tendinitis and overuse syndromes. They are similar with respect to the underlying cause as they all are the result of inflammation or swelling. Not always is the swelling noticeable, however. The swelling increases with repeated use, and the body never has the ability to recover on its own without appropriate rest. Since most of us depend greatly on our hands to live, play and work, these conditions are common. The most common tendinitis and overuse conditions seen in the upper extremity are Trigger Finger, De Quervain's Tenosynovitis and Tennis Elbow. Trigger Finger is a condition that can affect any finger including the thumb (trigger thumb.) Overuse of the fingers results in swelling of the tissues around the flexor tendons. The flexor tendons are thick cordlike fibers that are on the palm when we make a fist. Initial symptoms usually result in pain in the palm at the base of the involved finger. Noticeable swelling of the finger can occur. The finger becomes stiff. As the tissues become more swollen, the finger may start to catch when it is straightened and progress to triggering and locking. Triggering and locking causes further irritation and swelling. Evaluating your finger for this condition is straightforward, and it can be done during an office visit with your doctor. Generally, no x-rays or other tests are required. Depending on your symptoms and the findings of the examination performed by your doctor, treatment can vary from a single injection to surgery, both with an excellent success rate. If surgery is required, it is done in our office surgical suite under local anesthesia (that is, there is no need to be put to sleep) in about 30 minutes. Full recovery is usually within one month. DeQuervain's Tenosynovitis is a condition that affects the extensor tendons at the thumb side of the wrist. The tissues around the tendons become swollen with use. These tendons are responsible for extending the thumb i.e. like the hitch-hiking sign. 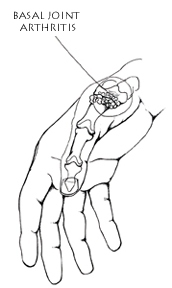 Initial symptoms result in pain at the thumb side of the wrist. The pain is worsened with movements of the thumb and wrist and particularly lifting. It is frequently seen in new mothers, because of repetitive lifting of their babies. The thumb may "catch" with certain movements or activities. Evaluating this condition is routine, and can be done during an office visit with your doctor. Depending on your symptoms and the findings of the examination performed by your doctor, treatment can vary from a single injection to surgery, both with an excellent success rate. If surgery is required, it is done in our office surgical suite under local anesthesia ( that is there is no need to be put to sleep) in about 30 minutes. Full recovery is usually within one to two months. Carpal Tunnel syndrome is an entrapment neuropathy at the hand-wrist level. 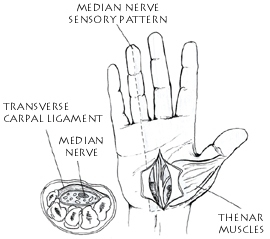 Simply put, it is a pressure problem on the Median nerve which is one of the main sensory nerves in the hand. Carpal Tunnel SyndromeA carpal tunnel syndrome often times is characterized by nocturnal awakening with numbness, tingling, parasthesias (electric shock type pain) in the hand and fingers and can radiate up the forearm sometimes to the shoulder and neck level. In addition, patients often complain of numbness and tingling during repetitive activities with their fingers and wrist. Activities such as driving a motor vehicle, brushing one's teeth, talking on the telephone, knitting, and reading a book are examples of activities that may cause symptoms. One may experience pain or weakness and also complain of dropping items. The etiology of carpal tunnel syndrome is diverse and ranges from a single trauma to repetitive motion. There is an increasing incidence of such problems in people who have endocrinologic disorders such as diabetes, thyroid disorder or is seen often during pregnancy. Certain types of inflammatory arthropathies can also predispose to such a condition. The treatment of carpal tunnel syndrome ranges from conservative to operative. The conservative modification, ergonomic modification, splinting, and /or local cortisone injection. If the conservative modalities are unsuccessful or if there is objective neurologic deficit, then carpal tunnel decompression is recommended. The prognosis with appropriate treatment is excellent with the majority of patients experiencing near complete relief of their symptoms when diagnosed and treated promptly. Left alone, carpal tunnel can predispose to a chronic nerve problem that at some point may be irreversible. The term "arthritis" is a very common description for joint pain that actually encompasses a multitude of diagnostic entities. Certainly, the most common forms of arthritis that lay people are familiar with are osteoarthritis, which is otherwise known as degenerative joint disease, and rheumatoid disease, commonly known as one of the more crippling forms of inflammatory arthritis. However, when one considers the entire diagnostic category of arthritis, one finds that there are more than 60 different varieties of arthritis that really are each very different and involve different mechanisms of development. In order to understand arthritis, one needs to have an appreciation of human joint anatomy. In simple language, the joints in the limbs of the human body are composed of a smooth slippery substance known as articular cartilage which caps dense supportive subchondral bone. This slippery hinge mechanism is surrounded by a joint lining called synovium which is supported on the outside by a complex of dense connective tissue known as ligaments. Arthritis which is a disease of the joints, develops in any one or all of the above named anatomic structures. In the case of osteoarthritis, the primary source of pathology develops in the articular cartilage. In the case of rheumatoid arthritis, the primary site of disease manifestations is in the joint lining. Because "arthritis" is such a complex disease entity it often requires the aid of specialists known as rheumatologists to aid in the diagnosis and management. A rheumatologist commonly works along with the hand surgeon and the occupational therapist to render diagnosis and treatment. The medical treatment of arthritis can involve several groups of medicines. Probably the ones we are most familiar with are the aspirins. In the last 20 years the nonsteroidal anti-inflammatory medicines have been developed which have been very important in managing pain and inflammation. For those more complex kinds of arthritis, such as rheumatoid disease, there are more sophisticated medicines such as Methotrexate, Plaquenil and Penicillamine for the management of joint inflammation. Finally, Prednisone has been a mainstay of arthritis pain since the mid 1950's. Beyond the medical management of arthritis and arthritis like conditions, there are many self help tasks that patients can engage in to help preserve their joints. This involves receiving careful instructions from therapists who can inform them of the proper way to use their upper limbs for lifting and twisting and carrying on their activities of daily living without putting undue stress on the injured and inflamed joints. Finally, it is certainly possible, in many cases, for the joints to be reconstructed or salvaged by the use of surgical means. The armamentarium of the surgeon includes joint fusions, and joint replacement, as well as, ligament reconstruction, for surgical management of painful joints. A ganglion cyst is a fluid filled sac. It is usually found on the wrist or fingers. It can change in size growing rapidly larger or occasionally shrinking. 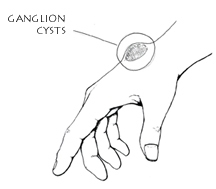 Ganglion cysts are benign. They are caused by underlying inflammation. Sometimes they occur after injury; sometimes their cause is unknown. The fluid filled sac of a ganglion cyst emanates via a stalk from a tendon sheath or joint. Increasing irritation of the underlying structures causes production of more lubrication fluid. It is this fluid that fills the cyst cavity. A cyst can interfere with joint motion. It can be uncomfortable at rest or with grasping and lifting. Initial treatment of a small ganglion cyst consists of anti-inflammatory medicine and a splint. For more advanced cysts, an injection/aspiration may be necessary. If other methods are unsuccessful, surgical excision may be recommended.